Halkidiki, the birthplace of Aristotle and home of holy Mount Athos, is the three-fingered peninsula in Northern Greece, where you can spend weeks on end exploring numerous fishing villages, countryside towns and a spectacular coastline with crystal clear beaches. Just an hour’s transportation from Thessaloniki Airport, leading south in the direction of Nea Moudania. Cruising with a car allows you to stop off at all the remote villages that grab your attention and slowly introduce you to the rural nature, which gradually becomes prettier and prettier- until you hit the eastern coast and meet the amazing sea of Kassandra- the first ‘finger’ of Halkidiki’s peninsula. Here is where most people choose to base themselves for the majority of their stay and from Kassandra you can easily make day trips to Sithonia- the ‘second’ finger, which is much quieter and offers a more relaxed feel. 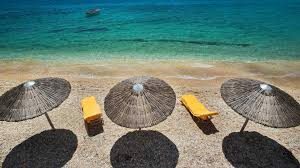 The beaches in Sithonia are stunning and if you are after a less crowded environment, this is the place for you to stay. The ‘third’ finger is Athos- an untouched area more frequently visited by locals than tourists who come here for a spiritual journey and enlightenment. Here you can visit Ouranoupoli, a low-key village featuring the Pyrgos Prosfeirou, a museum exhibiting ancient and Byzantine artefacts- but for most people it is more about capturing the sights of Mount Athos. Athos, the most holy peninsula of Halkidiki is made up of 20 monasteries, which can be viewed by sea on a coastal cruise along remarkable landscape. This is the only way for women to see the area, as men aged 18 and over are only permitted here and also need permission in advance to enter. 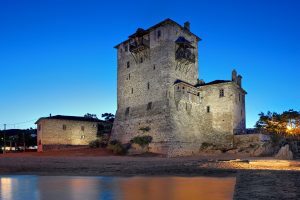 Halkidiki really is bursting with local traditions, culinary delights, historical monuments, spiritual sites, sea-based adventures and a buzzing nightlife, which guarantees a great getaway for all. Transfer Thessaloniki is the best way to explore Halkidiki! We are here to transfer you from Thessaloniki Airport to this beautiful place. Your transfer, is our pleasure!